Have you ever changed your mind on a card, one, two, three or even four times? Well that is what I did on this card. First I had white trees, then green trees, then green and white trees and then these trees. Have you ever used a Liquid Applique Pen? How fun it is. It poofs up when heated with a heat gun and gives the appearance of fur, snow or where ever you want to have some dimension. I used it as the snow drifts and fur on the boy's hat and collar. You must let it dry before touching it, or it "deflates". The Belleek Inspired Technique was used for the snow background. You can read how I did it here! I like how the dark blue background makes the snow pop! Dimensionals made everything stand out and not lay flat. The sled die was cut 3 times for the different colors and appliqued. OH YES! I've done that more times then I'd like to admit! And, YOUR end result is FABULOUS! Love how the trees turned out ... looks so real (and cold). LOVE Liquid Applique (and it comes in a few other colors too ... red, brown, black) The brown is fun for hot cocoa! And I've used the white on Santa's suit ... what fun! LOVE this little scene ... thanks for fun, wintertime inspiration! OH DEAR ... it's going to be snowing before we know it! Uuugh! LOL! Super cute card...love the sled and the little boy on it...so cute...the trees turned out wonderful...so much to look at..so wintery and fun!! Lots of great products used here!! Very beautiful card. Love what you did with the boy and sled and love the baby bunny next to him. Great card. Love the tree's. You're cards are always perfect, no matter how many times you redo them! 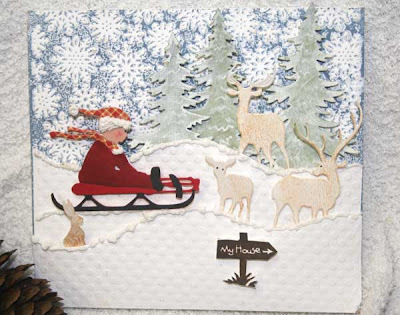 Beautiful winter card, Joan, well done!!! This card turned out wonderfully, just love it.